OK, let’s get this straight upfront; this is a good blues album. It covers a lot of the blues bases; you get slow blues, fast blues, funky blues, hints of gospel and some nice horns here and there. It’s an interesting listen and there’s nothing that makes you want to hit the skip button. It covers a lot of the ground that Robert Cray was covering in the late eighties/early nineties and the comparison stands up fairly well, but there is a problem with that. If that niche still exists, Joe Bonamassa has it well and truly covered and it’s a bit like “Highlander” – ‘there can only be one’. And the blues buffs will no doubt point out exceptions to this but while there are thousands of singer/guitar players out there, there aren’t too many, like the Reverend Shawn Amos, who don’t play. Having said all of that, if you like your blues without too many rough edges, played and sung with a bit of style and well-written (there are ten originals and two covers, “La Joliet” and “Bright Lights , Big City”), you won’t go too far wrong with this. Standout songs for me were the midtempo shuffle “Hollywood Blues” and the closing gospel ballad “The Last Day I’m Loving You”. And by the way, he isn’t really a Reverend. 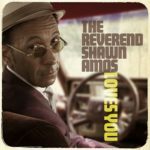 “The Reverend Shawn Amos Loves You” is released on Friday May 19th on Put Together PTM006.